Going meat-free is now a walk in the park when you dine at Botanical. DESPITE its salad days, Botanical’s debut in the trendy Bangsar Village II enclave seems timely, in view of the ever growing trend of healthy eating among city folks. While some stick to a vegetarian diet on certain days, others are choosing to go meat-free completely. The space that Bistro42 used to occupy has now turned over a new leaf into Botanical, the BIG Group’s first meat-free restaurant that serves an eclectic selection of delicious meat-free starters, pies, salads and sandwiches using garden-fresh ingredients. Gluten-free options are available whilst eggs and dairy are used sparingly in food preparation. Choice seats in the house range from comfy sectional sofa lounges to white wicker and padded garden chairs clustered within an outdoorsy courtyard surrounded by faux topiary hedges and potted plants. Those who prefer greater privacy can park themselves inside Botanical’s cosy French bistro-inspired confines. While you peruse the menu, try one of the thirst-quenching fruit smoothies or inventive mocktails. Our Rooibos Refresher (RM11.90++), a tangy tonic of fancy fruit tea, pineapple juice and honey is invigorating enough and a nice booster to revive flagging spirits and jaded taste buds. 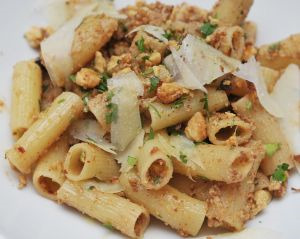 The Chilli and Walnut Rigatoni is best for sharing a sits rich, ‘meaty’ accents can be a tad cloying. We totally dig the wonderfully juicy Watermelon Lychee Salad (RM19.90++), the fruity duo adding their inherent sweetness to the mélange of purple cabbage, carrot, crispy salt and pepper-flecked beancurd puffs and roasted peanuts. A most welcoming departure from the boring green salads of yore. 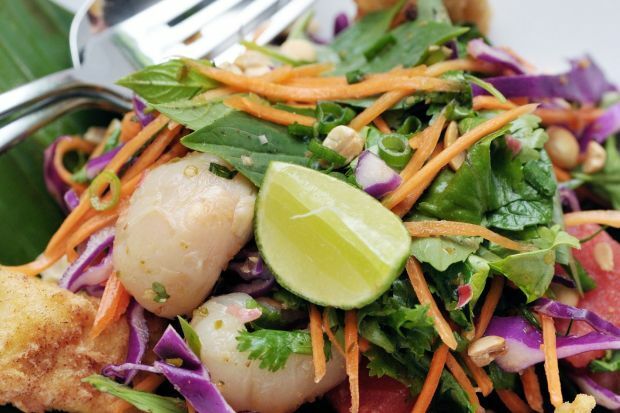 Tossed with Thai fish sauce, lime juice and sugar, this colourful combo will surely make converts of the pickiest non-salad eaters. If you’re dining alone, we highly recommend the Tomato Bruschetta (RM21.90++). Heaped with yellow and orange cherry tomatoes, white balsamic and buffalo mozzarella, this hearty slice of toasted ciabatta should leave you replete. Even the little cluster of salad on the side is worth its salt; a Japanese-inspired combination of frilly purple seaweed fronds, kelp, edamame (green soya beans) and sesame seeds in shoyu (soya sauce) dressing. The show-stealer in the Asian section has to be the silky smooth Inaniwa Udon (RM21.90++). Served in an ambrosial mushroom-based broth, the delicate threads of Japanese wheat noodles are complemented by earthy shiitake and shimeiji mushrooms, squares of crisp dried nori (laver) and cubes of custard-soft white beancurd. My dining partner, who’s a die-hard carnivore, readily agrees that the rustic dish’s subtle nuances are deeply comforting and soul-satisfying. 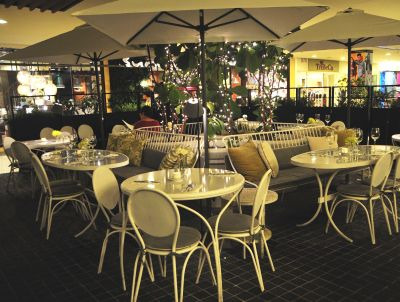 Choice seats: Botanical is a meat-free garden of Eden. Another simple but scrumptious dish worth considering is Broccoli Arugula Olio (RM19.90++). Despite its pared down approach, riotous accents and varying textures abound in the al dente spaghettini, blanched broccoli florets and citrusy arugula leaves slicked in olive oil and fresh lemon juice, and perked up with a scattering of dried chilli flakes, capers, garlic and toasted breadcrumbs. Standing out in stark contrast is the bold, brassy Chilli and Walnut Rigatoni (RM21.90++). Generously slathered in olive oil with crushed walnuts, garlic and parmigiano reggiano shavings, this pasta dish is best for sharing as its rich “meaty” accents can be a tad cloying once you overindulge. Luckily, the tube pasta is speckled with just enough chilli to let its robust spiciness blunt the offering’s flabby aftertaste. Personally, I find the dessert creations here a tad humdrum. While the Grilled Spiced Pineapple with Mascarpone (RM15.90++) tastes fine, I hardly consider plonking some thyme-infused honey, freshly ground black pepper and a dollop of pepper-encrusted mascarpone on a piece of fruit an acid test of the restaurant team’s culinary skills. At least the Strawberry Fruit Soup (RM15.90++) includes pink peppercorn ice cream that’s worth forking out money for in addition to buttercake croutons. Again I find it too simplistic to impress but don’t let my two-sen worth stop you from sampling this treat. After all, the proof of the pudding is in the eating.